Email logs should be available within 30 minutes of your request. Email logs are available for messages sent within the past 30 days before your request. Each email log can span a maximum of 7 days. To see email log data for a duration longer than seven days, create multiple requests. Email logs include emails sent through email actions, list email, and mass email, as long as the emails are sent through Salesforce. The date and time here are always in GMT, so make sure to convert into your timezone if you are checking for specific email at certain times. 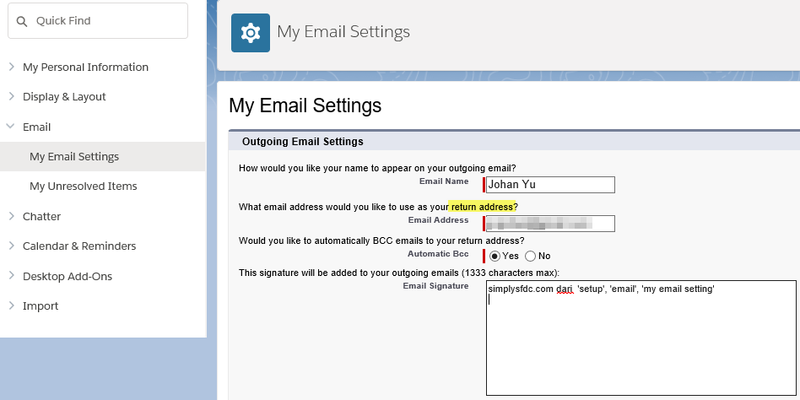 But, when you request for email logs, enter the time in your local timezone. D - Delivery: the email was successfully sent to the recipients. R - Reception: the email was successfully received by Salesforce email server. The email address of the person to whom the email is sent. There are 3 color highlights in above screenshot, this is for 3 difference emails. 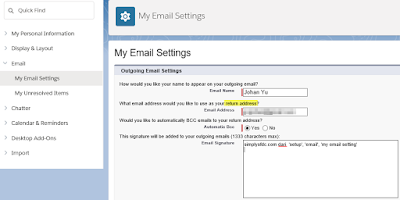 Email received by Salesforce email server (R), then send out in a few seconds (D). The yellow highlight means, there are 3 recipients in that one email, row 7 correspondence to row 3, row 6 correspondence to row 4, and row 5 correspondence to row 2. Each pair has the same Internal Message ID. When you open email sent in Gmail, you will notice email sender contain a portion of the sender in email logs (see above and below screenshots in pink). This is IP address of the email server that received the email sent. The size of the email in "byte", not KB or MB. 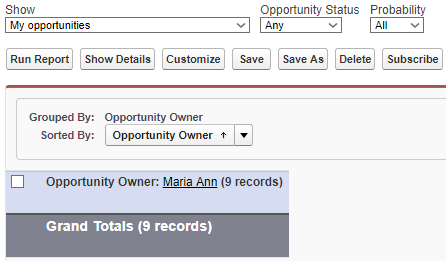 The Salesforce ID of the user who sent the email. If you are using Gmail, you can check this by click "Show Original"
The screenshot below shows the message header in Gmail, see the highlights in green. Let's see the difference between each option. In this sample, I'll login as "Maria Ann" and she has 2 subordinates: "Song Lee" and "Free Man". All opportunities owned by me, period! 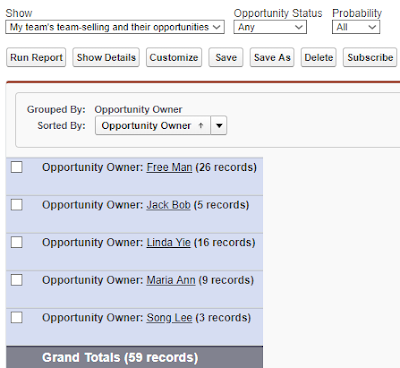 All opportunities where I am listed in the Opportunity Team, no matter if I am the opportunity owner or not. 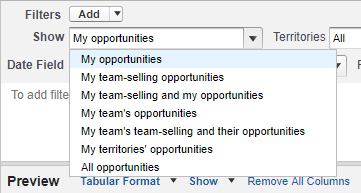 This is the combination of My opportunities and My team-selling opportunities, although it doesn't mean the opportunity will be listed twice if it fit into both criteria, so you can't just sum number of opportunity from My opportunities with My team-selling opportunities. All opportunities owned by me and all opportunities owned by users below my role hierarchy, including the indirect reports. All opportunities where me or any users below my role hierarchy listed as in the Opportunity Team, no matter who owned the opportunity. This is similar to My team-selling opportunities but extended to my subordinates. Only available when Territory Management is enabled. All opportunities that you have visibility. We can check the number of licenses purchased and remained from Company Information. But, can we get the same info using report? 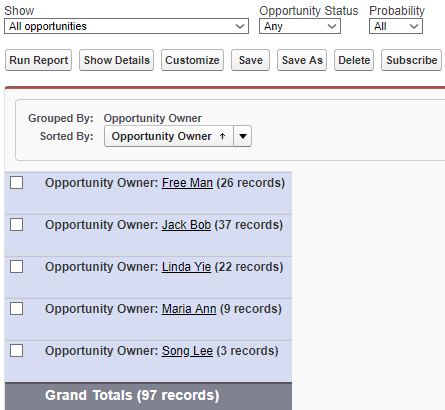 With make it as a report, we can schedule to deliver that information directly to stakeholders inbox. 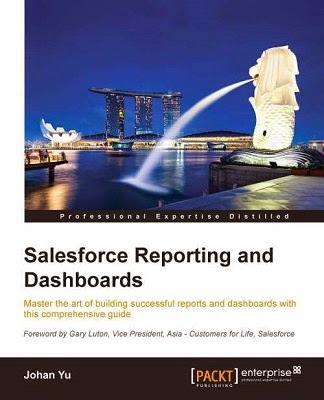 Salesforce out-of-the-box provides standard User report type, this is good enough to report user information, including login history. 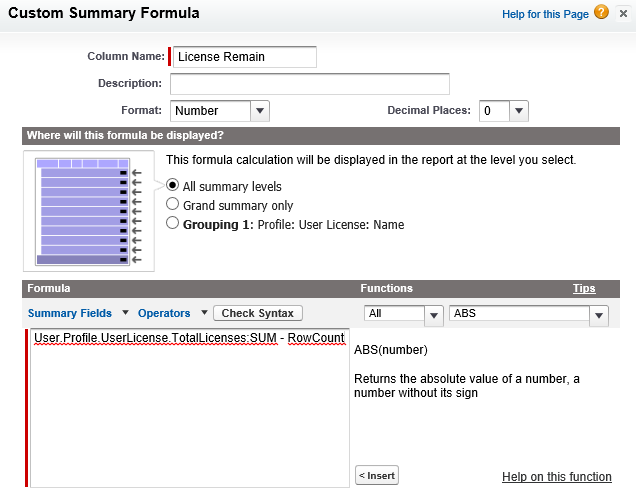 But, that report types not able to tell the number of licenses purchased. Create custom report type and select Users as the primary object. In the Fields Available for Reports, edit the layout and add lookup field from Profiles, and select all fields under Profile. Even, in this case, we just need Name and Total Licenses information. 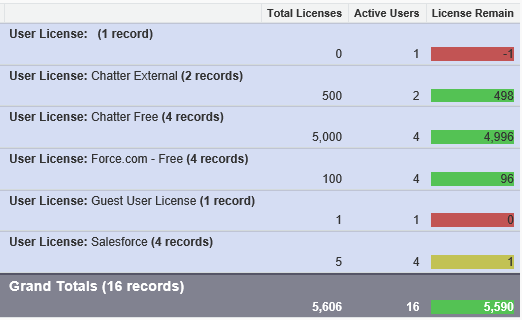 You may want to change the Total Licenses label by double-click the field, remove "Users: Profile: User License:". 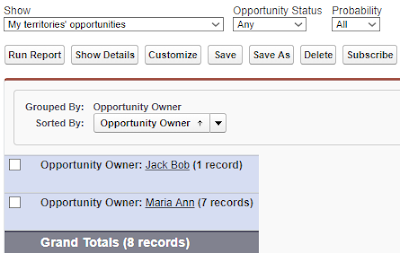 Make sure to set the new Custom Report Type as deployed. Create a new report using the new report type. 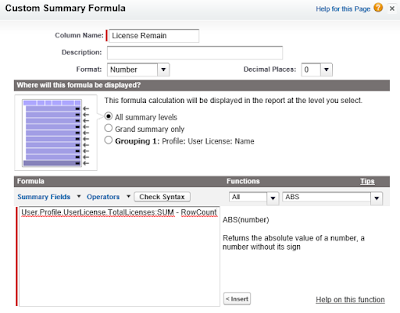 To make it looks nicer, set the report as Summary Report, group by User License and filter only for Active users. 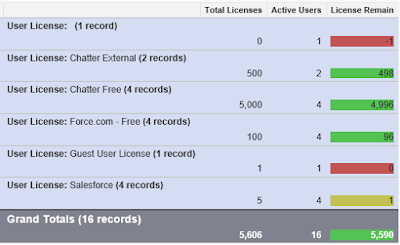 You can add Conditional Highlighting to get user attention when remaining licenses reach a certain threshold. 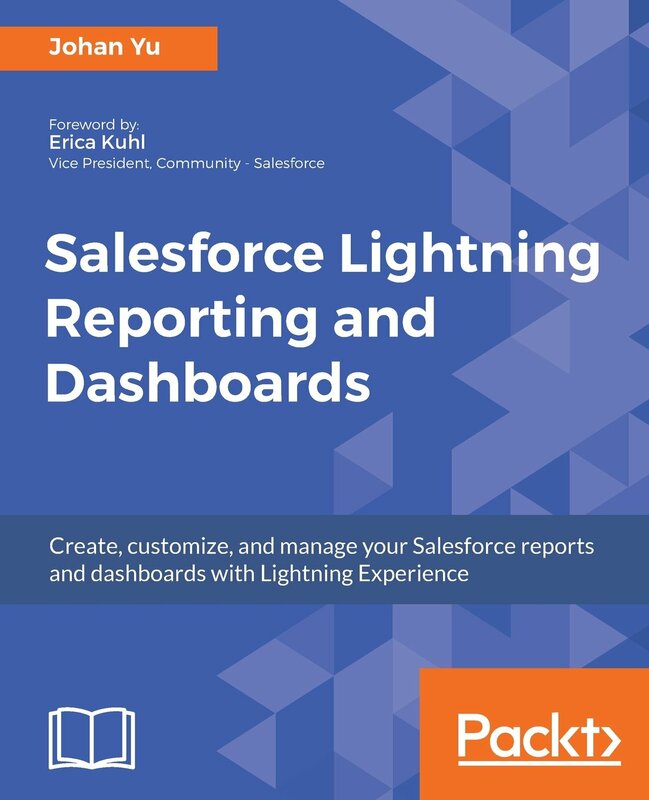 How is the report looks like in Lightning? Except without Conditional Highlighting, the report will still show nicely. This blog is more for Classic, as the attachment is no longer support in Lightning, although existing attachments will be still available in Lightning, you just can't upload the new attachments in Lightning. 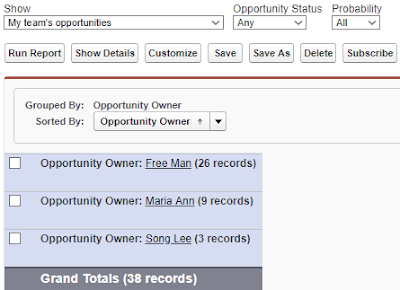 Here is the requirement, users would like to have the ability to view the attachment within one click from record page layout, assume only max 1 attachment per record. By default, you need to scroll down to the "Notes & Attachments" related list, then click the file name, this will open attachment page (00Pxxxxxx), which also show the file size, then click "View file" link -- this is two click from the record page. 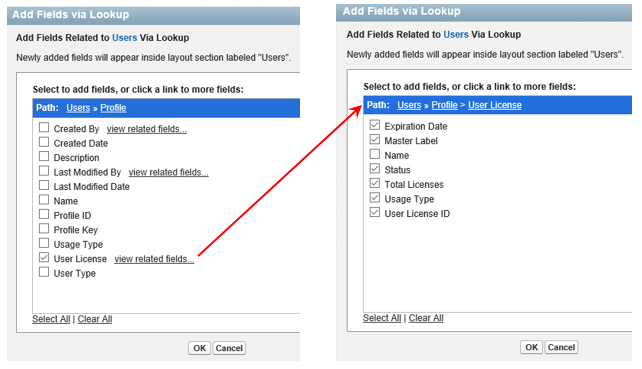 Using formula field below, it will show View link when the "id" is available, otherwise, the View link field will not be visible. 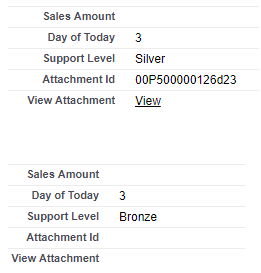 This is to assume that Attachment_Id__c value (a custom text field) has been populated by apex trigger. The above formula field will work in Lightning, but "_blank" target will not work; the image will overwrite existing web browser window. Jeff's blog How to Customize Salesforce Attachments explains how to "add" custom fields for Attachment using a custom object, act as a layer between the real object with attachment.